The name Berlinetta is a traditional Italian term that refers to classic sports cars, specifically luxury two seaters with a shape that is harmonious and balanced, never extreme. The front engine and long hood recall the proportions of supercars lost to the past; sitting further back in the car provides a unique feeling and experience now abandoned by modern supercars. It’s a luxury “Gran Turismo” that does not scream its performance to the world, but hides it - almost deceptively - behind the beauty of its forms. It’s a term that means a car at the height of automotive technique and performance, but one with a style that recalls the great coupés and custom-built cars of Italy’s Golden Age. The Carbon-Aluminum hybrid chassis has been designed to ensure both lightness and strength, as well as to stand out for its style. The central tub is made of pre-impregnated carbon fiber and cured in an autoclave at 180 degrees – it offers maximum torsion rigidity and the beauty of an object perfectly integrated with the interior style, as it remains fully visible in the inside of the car. The front and rear sub-frames are made of aeronautical aluminum with suspension plates entirely CNC machined from solid billets. Each of the 4 suspension plates is manufactured from a single block of 120Kg of this aluminum, but only weigh about 10Kg by the end – an enormous effort whose final result allows all the suspension components, including control arms and shock absorbers, to connect on a single engineered piece without any joints, connections or welds. This provides not only extreme rigidity and resistance, but most importantly, a centesimal precision in the position of the suspension components - and therefore in the suspension geometry and kinematics. The complete chassis, including all structural supports for radiators, engine, transmission and the electric motor weighs only 150Kg. The combustion engine is a modern V8 5.0L 32-valve double overhead camshafts (DOHC) and dual variable timing independent (Ti-VCT). To ensure optimal weight distribution and a lower center of gravity, the engine is positioned entirely behind the front track axle in a rather low position, thanks to the dry sump lubrication. The engine is supercharged by a 2.9L twin-screw compressor that offers a progressive increase in torque, even at low revs, at a constant pressure of 11 PSI. The compressor is equipped with a liquid intercooler with 2 radiators located in the side air intakes of the front bumper. The combustion engine alone delivers 750 horsepower at 7,000 rpm and 878 Nm of torque at 4,400 rpm. The final assembly of the internal components of the engine is carried out meticulously, by hand, in Italy. The engine’s electronics management is entrusted to a MOTEC ECU, and is supported by a software package that was specially developed by Puritalia and a proprietary OBDII control unit that comply with EURO 6 environmental regulations. The advanced axial flux electric motor is supplied by Yasa and produces up to 370 Nm of torque and 215hp of peak power at a weight of just over 25Kg. The engine was integrated by Puritalia directly on the rear differential, thanks to its extremely compact diameter of 305mm and axial depth of 106mm. In this configuration, the torque delivered by the electric motor bypasses the gearbox gear ratio and acts directly on the rear wheels through the final ratio only. This configuration is optimal to transfer the enormous torque provided the electric motor to the wheels, that is always fully available from 0 to 7,000 rpm. The control of the electric motor acts alongside the automated gearbox control AMT, increasing the thrust during the opening of the clutch necessary for gear shifting. This results in continuous acceleration - even during gear changes. Puritalia engineers also incorporated an electronically managed clutch that disengages the electric motor from the differential in specific usage conditions to avoid dragging when it’s not needed. To ensure the performance of the electric motor even during the most intense periods of use, the engine temperature is constantly monitored and managed by a cooling system that provides a flow of up to 20 liters / hour of dielectric oil. 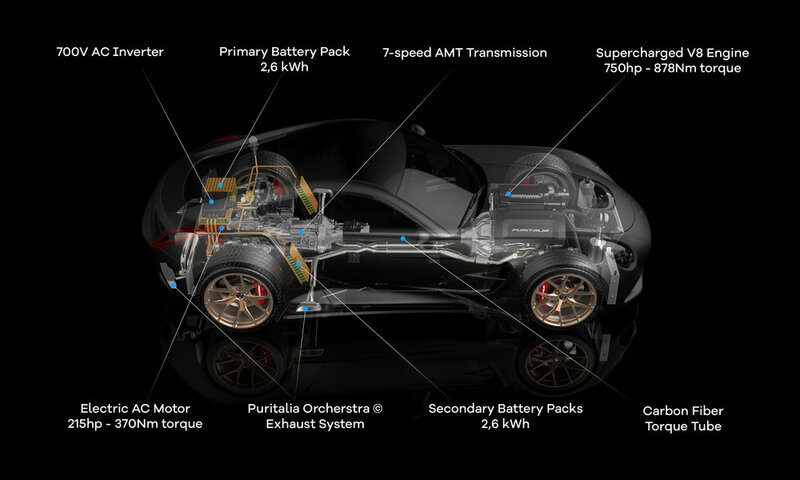 Puritalia Berlinetta has two lithium-iron-phosphate (LiFePO) battery packs, entirely designed and built by Puritalia, that guarantee a total capacity of 5.2 kWh; the main battery pack is positioned under the trunk area while the secondary is in the area behind the seats, in a low position for the car’s center of gravity. The two 700V battery packs are dynamically managed in parallel; they’re used individually in normal conditions, and in combination (to raise the current up to 230A) when the Puritalia eMozione© function is activated, in order to provide the maximum power and torque. A complete charge of the battery packs requires just over 3 hours via an electric socket and the special charger supplied with the car. The batteries can also be charged during braking and while coasting through a special function that can be activated by the driver. Both battery packs integrate the BMS (Battery Management System) and cooling management system. A great deal of attention was given to studying heat diffusion and resulted in the design of the appropriate cooling systems, because, contrary to what one might think, the electrical components of the hybrid powertrain generate as much heat as a combustion engine. The air intake on the hood leverages the air depression to facilitate the expulsion of heat from the engine compartment. The cooling of the powertrain is carried out by 10 radiators positioned near the air intakes on the front and rear bumpers and the flat bottom of the car. These radiators provide for the cooling of the combustion engine, the intercooler, the transmission, the differential, the electric motor, the AC inverter, and the battery packs. The transmission is 7-speed with AMT electro-hydraulic robotization with steering wheel controls. For optimal balance of the weights, the gearbox is positioned in the rear of the car and connected to the engine by a carbon fiber torque tube that hosts the light carbon fiber driveshaft. The 210mm diameter torque tube also acts as a structural element, helping to substantially increase the torsional rigidity of the chassis. The AMT system was developed by Puritalia in collaboration with a leading Italian company in the sector and allows for a gear change in about 150 milliseconds, torque-to-torque. At the same time, the electric motor keeps pushing its torque to the rear wheels for virtual “zero-delay” shifting. The AP racing 3-disc clutch, controlled directly by the electro-hydraulic AMT actuators, is manufactured with custom-made friction material that has been specifically formulated for the torque specs of the Berlinetta and its road use purposes, ensuring a smooth modulation and firm engagement even in standing maneuvers. The gearshift can be set in automatic or manual mode; when in manual mode, the gearbox is operated through the paddle-shifters located at the steering wheel. The limited slip differential is electronically operated (eLSD). The Puritalia Berlinetta is also unique in the driving modes it offers. There are 4 driving modes, as well as a bonus one called “Individual” that can be customized ad hoc, based on the driving style of the owner. The SuperHybrid is the driving mode that offers maximum driving enjoyment, intended as a perfect balance of performance and comfort. In this mode, the car is connected to the Puritalia Purhydrive© cloud-based system for efficient management of the energy used by the electric motor, which is dynamically provided by Artificial Intelligence algorithms that focus on self-learning the driving style, the driver’s habits, and online live data feeds. In this mode - still hybrid - the driving is more sporty, thanks to the progressive stiffening of the suspension and steering. The accelerator pedal becomes more responsive, and the combustion engine switches on a more powerful map. The robotized gearbox becomes more aggressive and reduces shift times to a minimum. All of this is unmistakably emphasized by the sound of the 4 exhaust tips that, through the Puritalia Orchestra©, provide a greater opening of the valves that regulate the active side pipes. Here, all electronic controls are excluded for the pure track experience. The electric motor provides its peak power continuously. The combustion engine switches on the most powerful and aggressive racing map, and the exhaust sound provided by the Puritalia Orchestra@ system become even bolder. And finally - designed for entry and exit from urban centers, the Berlinetta can travel up to 20Km in this exclusively electric mode. Though not yet available, E-Power will be with a remote update of the onboard software in the future. In all modes - with the exception of E-Power - the driver can activate the Puritalia eMozione© switch which raises the current supplied to the electric motor for an additional torque of 370Nm (equivalent to the total torque of an Audi S3) for a continuous period of 45 seconds. And, for an even more personal driving experience, the driver can manually tune all of the main parameters related to the following systems: ABS Traction Control Electric Power Steering Suspensions AMT Electric Motor Side Pipes valve This makes it feel remarkably close to a gaming-like experience. 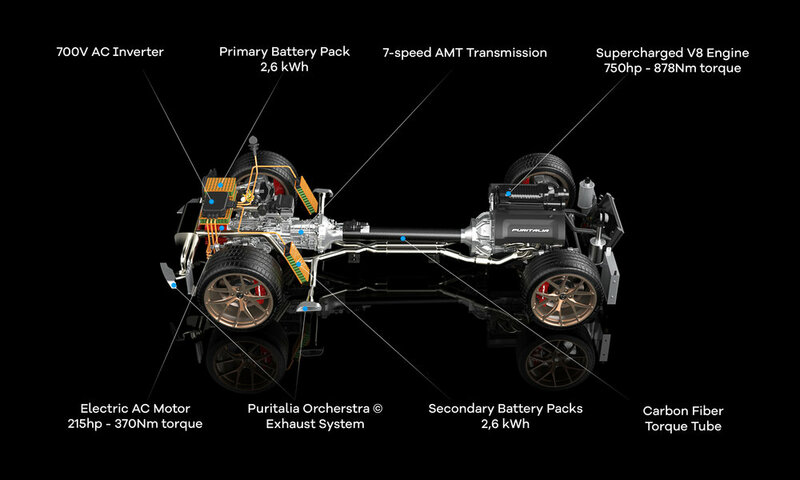 The Purhydrive© technology redesigns the way hybrid cars manage the distribution of the propulsion between the combustion engine and the electric motors, when they are usually managed statically by algorithms written inside the car ECUs. Thanks to an online connection with a cloud computing platform that provides enormous computing power, the Purhydrive© system offers dynamic and personalized management, and balance of the power supply, through self-learning of the drivers’ style and habits. The modern software technologies of Big Data and AI (Artificial Intelligence), allow us to foresee and simulate the path in a virtual way, crossing the data with external information such as weather conditions and traffic data. The virtual route simulation provides valuable information in advance, such as turns, ascent and descent sections, and acceleration and braking points. The system also incorporates information from the on-board sensors, such as vibrations, the state of the asphalt, and bumps in order to “self-learn” and modify the suspension setting dynamically for the next pass on the same street. The Purhydrive© system, a strategic asset of Puritalia Automobili, is constantly developing and improving and so its future extension to other commercial applications, those where the efficient and dynamic management of two or more energy sources is particularly important, is also envisaged. This is the digital nervous system of the car that is designed entirely according to a “Silicon Valley” approach. A modular software kernel is spread over all functionalities and controls, thus allowing remote maintenance for the car’s entire life cycle; not only updates for any errors or malfunctions, but for the release of new functions as well. Through the Digital-DNA©, the driver can configure and control the entire car through the central touch-screen and voice controls; a special app also grants the owner remote access to all the car’s functions through their smartphone. The remote diagnosis and online assistance function even allows Puritalia technicians to connect to each car to verify errors, problems, or to provide assistance to the driver as needed. The Berlinetta body is made entirely of last generation carbon fiber. In order to attain its characteristic lightness, Puritalia uses only pre-impregnated carbon fiber that has been cured in an autoclave with the pressure at 8 bar and a temperature of 180º. To improve the rigidity and preserve design lines during the assembly, 60% of the body is achieved through only two components; each is laminated as single monocoque and thus ensures continuity of fibers without junctions or joints. The front area is called the “Front Body” and the central area the “Upper Body”, and combine for a total weight of only 27Kg. Stylistically, this composition is reflected in the lack of the traditional cuts that separate the front bumper from the side fenders, and the absence of those that separate the roof with the windscreen area, the pillars, and the rear quarter. The finishing and painting process of the carbon panels includes up to 5 layers of base paint, as well as 5 layers of a transparency (glossy or opaque), that depends on the finish and desired color. Then, there is a final polishing process with 3 total steps of fine-grained block sanding of the body. This is an extremely hands-on and laborious process, but it ensures perfection of the surfaces and reflections on a level that is never reached by the automated painting processes used for standard OEM cars. All in all, the process of painting and finishing all carbon fibers components of the car requires 800 hours of work by hand. The choice of colors and finishes is extremely customizable, and Puritalia ensures that each car will have its own unique color scheme and its own paint formula - registered for the owner - so can’t be replicated for any other Berlinetta. Among these countless options, as part of the Puritalia Sartoria© program, customers can decide to have the entire body painted with visible fiber - one of the most exclusive options available that will be limited to just 10 cars. Once you get inside the Puritalia Berlinetta, you immediately sense a different atmosphere. It is created by the highest quality materials in which the carbon fiber, placed in contrast with a glossy and opaque finish, is certainly the predominant element responsible for the feeling of quality and exclusivity. The clean aesthetic is accentuated with aluminum elements, all made exclusively by CNC machining from solid aluminum billets that are brushed and polished by hand, and by an almost total absence of mechanical buttons and levers. Here, as for the rest of the car, there is no room for plastic. The central cell of the carbon fiber frame is left exposed but blends perfectly with the style of the interior panels that complete the design, as opposed to covering it with carpeting. All the car’s functions can be accessed through the central 10-inch touch screen whose functionality has been designed in conjunction with the two joysticks placed immediately below on the central tunnel. The Puritalia QuickCommand© function allows you to operate any command (such as windows, lights, air conditioner, locks, etc ...) in just two clicks of the joystick, without taking your eyes off the road. The dashboard is digital with a 12.3-inch high-resolution TFT display, and all HMI interfaces have been internally developed by the Puritalia graphic team using the latest 3D effects and animation. Particular attention has been paid to the ergonomics of the driving position and to the driver’s comfort; in contrast with other super sports cars with similar performance, the seat is easily accessible and always comfortable - even for taller people - with leg room comparable to that of a modern saloon car. For this reason, instead of the lighter monocoque seats, the Berlinetta is equipped with elegant sports seats supplied by Sabelt, customized and covered in strictly Italian NAPPA leather, and electrically adjustable. The Berlinetta production is limited to 150 cars. Price starts at Euro 465,000 + VAT, depending on the country of delivery. Each Berlinetta is built to the customer’s specifications to guarantee that each car is truly unique and adheres to the Puritalia brand philosophy - according to which, each of its cars: Must be built strictly by hand, in limited series; Must be heavily customized for each customer; Must be built in Italy, exclusively by expert Italian artisans; Must have a distinctive technological footprint that differentiates it from other cars; Is not for everyone, but only true connoisseurs that appreciate the car in every detail. Owning a Berlinetta is not like any other car. Owning a Berlinetta means becoming part of an exclusive club of sports car enthusiasts who embrace the Puritalia philosophy that sees each customer as an “Ambassador” of the brand. For this reason, each customer is asked to actively participate in the building process of their car, and to know every technical and constructive detail. Each customer shall assist in-person at key stages of the building process, like the first engine fire-up and the exciting moment of final delivery. A rigorous selection process guarantees that each customer embraces this philosophy, and understands what it means to become a Puritalia Ambassador. Furthermore, through the exclusive Puritalia Sartoria© program, the customer will be able to experience this journey of building their own car as an extension of their taste and personality. Each customer is assisted by a personal designer who works with them during every phase of the personalization done from either pre-packaged or completely custom options. However, among the many pre-packaged options, there are a few that qualify as “Exclusive Option” and are reserved for just one car; others are “Limited Option”, like the exposed carbon fiber bodywork, for only 10 cars; and a special aerodynamic package is limited to only five.